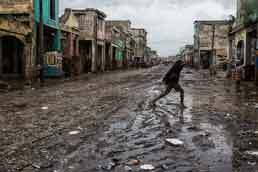 A woman crosses a muddy street in downtown Port-au-Prince after Hurricane Matthew hit Haiti on 4 October 2016, bringing heavy rains and winds. Photo: © UN/MINUSTAH/Logan Abassi Click to see larger photo. The first reports to arrive were of vast flooding and destruction, rivers of brown water pulsing through streets and homes shorn of tin roofs. Eventually, the talk turned to livestock lost, a veritable fortune for those living in the poorest country in the Western Hemisphere. The storm left a broad tableau of devastation: houses pummeled into timber, crops destroyed and stretches of towns and villages under several feet of water. In the southern city of Jérémie, 80 percent of the buildings were destroyed.